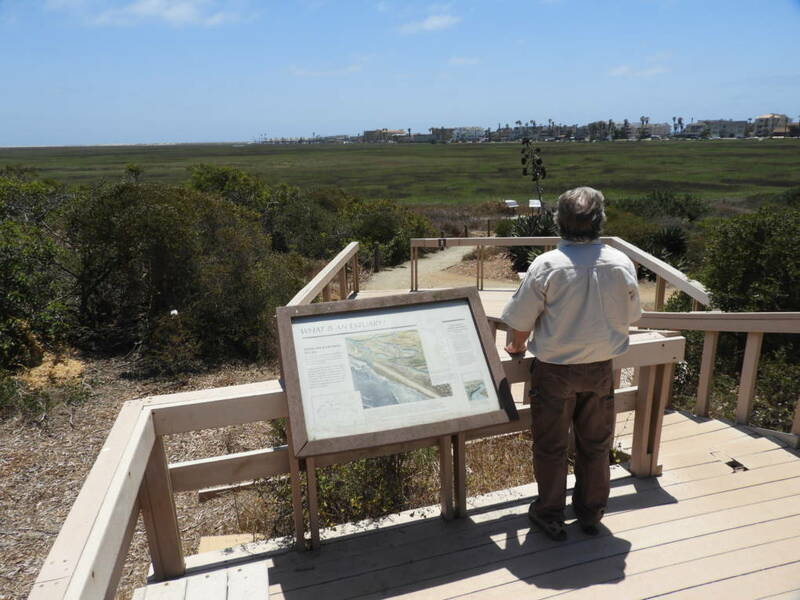 IMPERIAL BEACH, California — Among Serge Dedina's first stops on a brisk morning tour of this small seaside city is a wall that separates a row of frayed apartments from wetlands known as the San Diego Bay Wildlife Refuge. 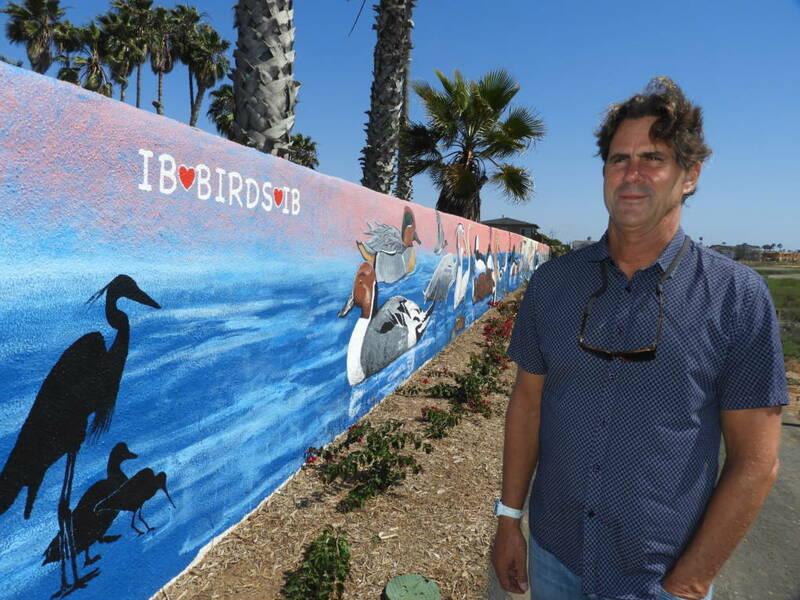 Artists are dabbing finishing touches on a mural of sea birds against a flamingo-pink wall. This splash of color is important to Dedina. It's something he can do — his city's leadership can do — to cheat the austerity that comes with having one of the smallest city budgets in the state. Dedina, 53, is the mayor of this oceanfront community at the southern edge of California, separated from Mexico by the estuary of the Tijuana River. Water marks three borders around Imperial Beach. And what prosperity there is in Imperial Beach comes from the ocean and its surf. The city logo is a classic Woody station wagon with a surfboard poking out of the back. People come here for the beach and the estuary. But with the climate crisis, the same water has become the single greatest threat to Imperial Beach's future. So last year, facing a problem it sees as too expensive to bear, the city filed a lawsuit seeking compensation from major oil, gas and coal companies. It accuses them of knowingly contributing to sea level rise and coastal flooding by producing fossil fuels and ignoring warnings about the consequences. For Dedina, the math was simple. 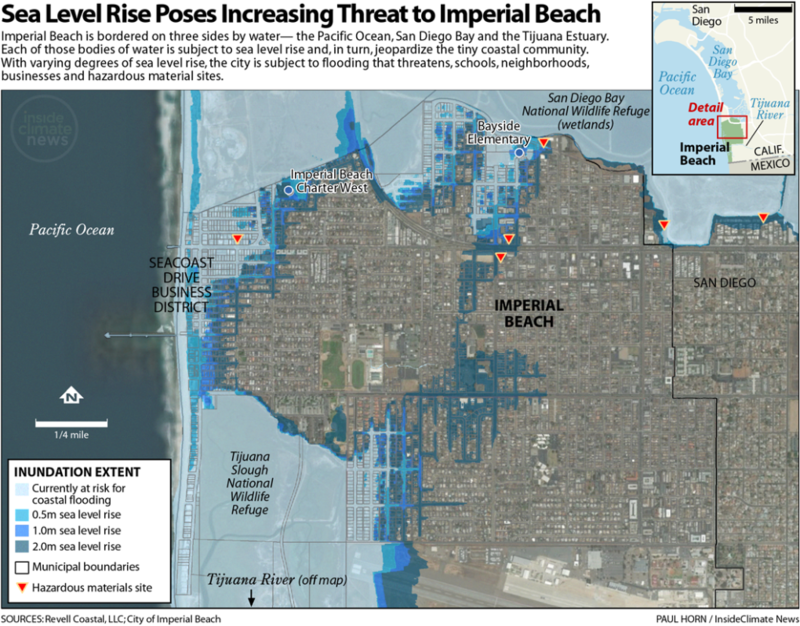 There's no way Imperial Beach, with its slim city budget of $19 million, can pay for all the damage to roads and city property that experts say is coming — and mounting research pinpoints burning of fossil fuels as a key driver of that sea level rise. A 2016 study noted that beach erosion here has been accelerating — today the pace is just over a foot a year — and is expected to reach 6 feet per year by 2100. Nor can the city afford remedies like sea walls, which one study said would cost at least $50 million. "I've been watching the coast and ocean since I was a kid," said Dedina, a surfer and veteran of local environmental fights over the last four decades. "It became clear there was a different feel to what I was seeing, that there was a different scale to the ocean." "Something bad was going to happen," he said, "we had to try to stop it." There’s another statistic that makes climate change a public safety issue here: There are dozens of sites in and around Imperial Beach where handling of hazardous material is permitted. And a recent study on sea level rise shows locations including military sites that handle hazardous material and underground storage tanks that are vulnerable to flooding. "We are literally learning every day what will need to be done to address these issues," said Andy Hall, Imperial Beach's city manager. The Imperial Beach lawsuit sweeps up 37 companies, including ExxonMobil, Chevron, BP, Royal Dutch Shell, ConocoPhillips and Peabody Energy. Since Imperial Beach and the counties of Marin and San Mateo chose a courtroom showdown, five other cities and counties in California have also sued. Around the country, others have done the same, including New York City and municipalities in Colorado and Washington State. 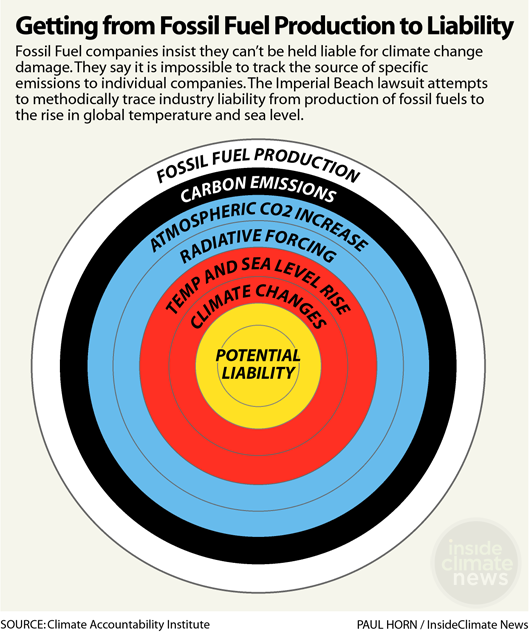 Some of the suits expand the harms of climate change beyond sea level rise to include wildfires, drought and pestilence. "These communities are facing massive costs that will have to be paid either by their taxpayers or by the oil, gas and coal companies who caused them," said San Francisco lawyer Matt Edling, who represents Imperial Beach and five other California cities and counties. The companies, which did not respond to interview requests, are fighting back hard, both in court and in a campaign of public messaging, calling the suits frivolous and misguided. They won dismissals of San Francisco's and Oakland's lawsuits on June 25 after getting them moved to federal court. But Imperial Beach's case is still in state court, where the law is friendlier to municipal plaintiffs. The lawsuits could take years to wend through the courts. The outcome is unpredictable: Billions of dollars could be awarded, or fossil fuel could be given a pass. 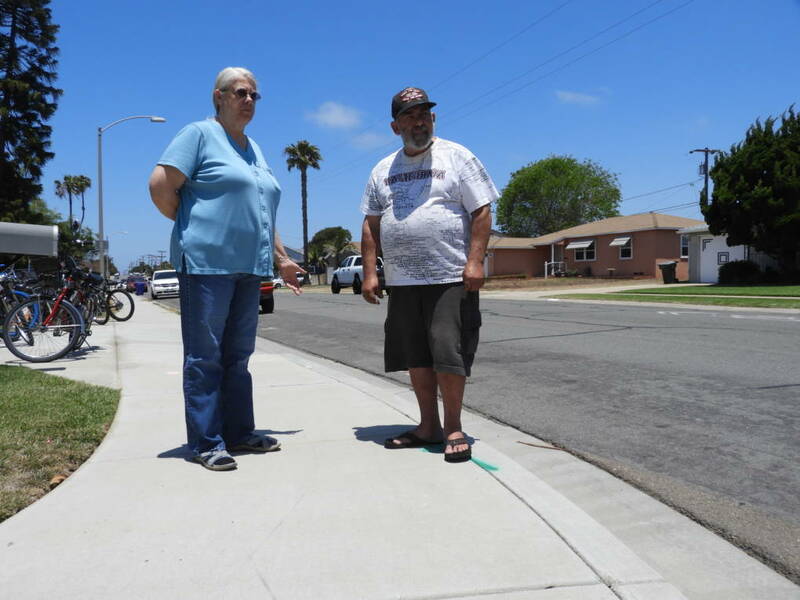 During his tour of the city, Dedina stopped on Descanso Street to highlight the ugly face of sea level rise that's likely to swamp this 4.5-square-mile community of 27,000 people. A third of the city faces ruin by flooding, he says. These days, when the tide is high and the ocean is roiling, Descanso and other streets become funnels, sending ocean water into the city. But in the same conversation about dire consequences, Dedina pauses to describe a resilient little city accustomed to struggle. Not long ago, Imperial Beach was disputed turf for Hell's Angels and Mongols motorcycle gangsters who often tangled. It was seen as an outlaw city whose best attributes were cheap apartments and reliable surf action. The city remains a little rough around the edges; more Atlantic City grit than Cape Cod posh. This is a working-class town, nothing like La Jolla, the upscale and better-known beach community some 20 miles north. 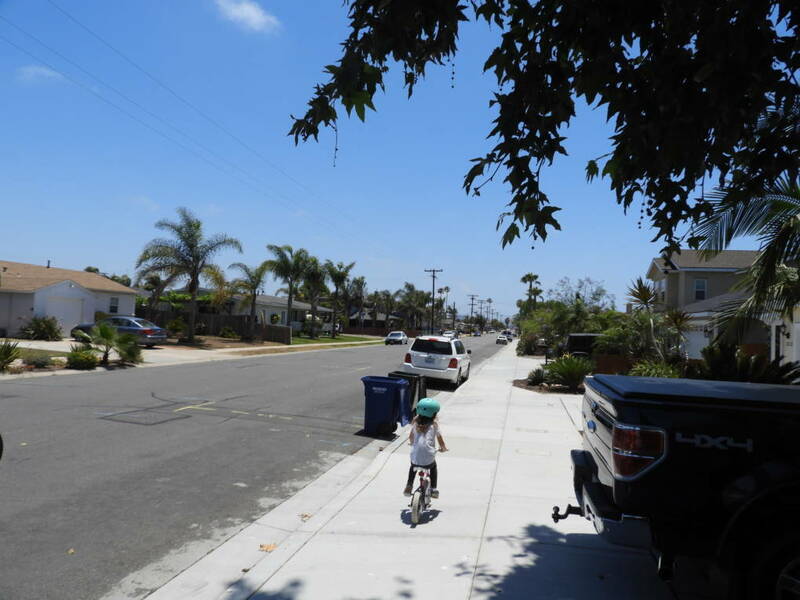 Demographics show 13 percent of the Imperial Beach population lives in poverty, even as the average price for a home has jumped to $650,000. Middle-class families are finding a place that is changing, softening a bit as a bedroom community for the bustling San Diego metropolitan area, 14 miles north on Interstate 5. Imperial Beach boasts 323 days of mostly or partly sunny days a year. Its beach is the city's gemstone. Non-stop volleyball and surfing present the quintessential picture of Southern California life. Dedina, however, has seen warning signs that the city's idyllic life is in peril, especially when the ocean is whipped by El Niño — a complex meteorological event in which the Pacific Ocean becomes significantly warmer than usual and triggers severe weather patterns across the globe. The increased volume of water from ocean warming becomes an even larger force when churned by El Niño. Dedina recalls the winter of 2015, when heavy rain led to extensive damage. Those storms were among the strongest El Niño-related events on record. Ocean water breached the riprap of boulders and poured into garages and buildings. San Diego Bay slopped over the city's northern limits. Bayside Elementary school grounds became a soggy mess. The surge pushed back into storms drains and flowed into inland neighborhoods. "We saw some of the worst coastal flooding that we'd ever seen," Dedina said. "In fact, in our bayfront we had the worst flooding ever." 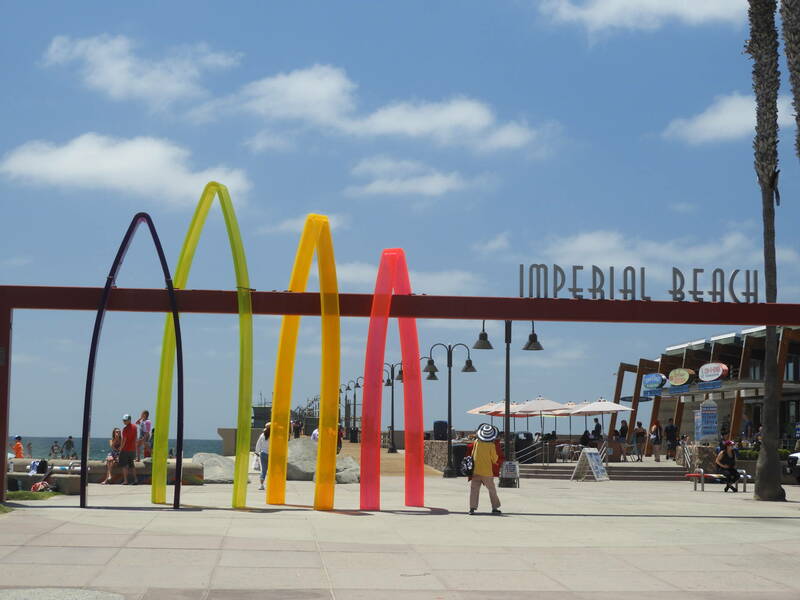 Imperial Beach's future is laid out in a 2016 study commissioned by the city. It shows sea level has already risen significantly along the city's ocean side and bay side and appears certain to continue. Destructive flooding is expected to become routine by the year 2100, even if emissions stopped tomorrow. As many as 700 homes and commercial buildings could be lost to coastal flooding with a sea level rise of 6.5 feet. The Tijuana River Estuary to the south could also merge with San Diego Bay, submerging the heart of the city's residential section. An estimated 30 miles worth of city roads, about 40 percent of Imperial Beach black top, could become impassable. More than 15 miles of sewer lines could fail. For Robert Newton and Judy Creveling, both in their 60s, that section of town was their dream destination. They built a two-story home on Connecticut Street nine years ago with the intention of living out their lives there. The city's sea-level rise study shows their house sits in a flood zone. Although the worst-case scenario is still decades off, even now stormwater collects on their street more than it used to. The couple lives on a fixed income of Social Security; they make a bit extra selling customized motor-driven bicycles. They can't afford to move from their home, and they can't afford to fortify it against potential flooding. "What happens if it keeps getting worse?" Creveling said. "It takes away that peace of mind, thinking that we have a home for the rest of our lives." David Revell, chief scientist at Revell Coastal, which conducted the Imperial Beach study, said the city cannot win the battle against the rising ocean. It can moderate the harm with tactical planning that includes accepting some loss. "Hard choices will have to be made," he said. "Some things will have to be sacrificed to sea." The city's budget now goes to fixing streets, trash pick up, the police and maintaining sidewalks. Spending money to protect infrastructure means there would be little left for "luxuries," such as a new community pool, a playground or upgrades to the senior center. Contrast this with San Diego, which has set aside $83 million this year alone for climate resiliency measures that include fortifying against sea level rise. 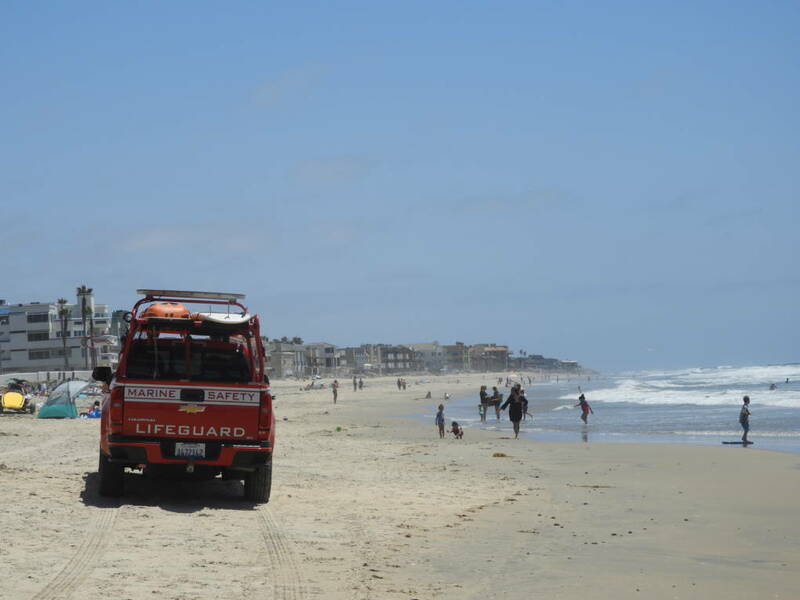 Imperial Beach is trying to figure out how to add costly seawalls and jetties. It is requiring new developments to be built above the 100-year flood line. And city planners are addressing susceptible property, parcel by parcel. But it's the litigation against fossil fuel producers that gives Imperial Beach a real chance, Dedina believes. "We cannot provide for our residents and address the real costs of climate change. ... What we are doing is confronting the social and economic inequity our community faces." Imperial Beach is not facing this future alone. San Mateo County worries about high tides flooding San Francisco International Airport. Marin County estimates climate change damage to homes and business could amount to $16 billion. Landslides, wildfires and drought put residents of the city and county of Santa Cruz at greater risk. In New York, officials say climate change-related harm will come from more frequent and more intense heat waves, extreme precipitation and sea level rise. It cites hundreds of millions of taxpayer dollars already being spent to mitigate climate change hazards. And, in Colorado, the Rocky Mountains' dwindling snowpack threatens the state's water supply for people and agriculture. Lawsuits like Imperial Beach's are meant to set new, far-reaching precedents in holding polluters financially liable for the harm they inflict. Until now, they have not been made to pay anything for global warming damage. The companies being targeted are among the world's richest. The 37 defendants got wealthy by selling products that in the past half-century accounted for a fifth of all the world's greenhouse gas emissions, according to the city's lawsuit. And for at least the past three decades, they understood the risks. The lawsuits lay out a detailed timeline back to 1965, when President Lyndon Johnson told Congress that burning fossil fuels was responsible for an increase in CO2. And they use the industry's own decades of admissions to show how much the industry was aware of the dangers. The companies' vigorous defense, mounted by some of the nation's elite law firms, is that they can't be blamed. It's not possible, they argue, for any one polluter's contribution to be blamed for any one city's calamity. And blame should rest on all the producers and all the consumers of fossil fuel all over the world — not on a handful of producers. "To meet their burden of proof, the plaintiffs are going to have to thread the eye of the needle to show that it is the named companies responsible for the damages being alleged, and not all of the other industries that are emitters or the developing industrial powers like China," said William Ruskin, a lawyer who has spent his career defending corporate giants against tort, environmental and liability claims. Scientists have been working to answer that question since at least 2003, when Richard Heede of the Climate Accountability Institute began research that has led to a meticulous apportioning of climate damages to carbon producers. Step by step, they documented each big energy company's production of fossil fuels. They calculated the resulting emissions from burning it all, and traced each one's contribution to the buildup of greenhouse gases. Finally, they determined the amount of warming attributable to each, along with their share of the ensuing damages — peer-reviewed stepping stones marking the pathway to liability. The latest of these studies found that just 50 companies, from 1980 to 2010, produced the polluting fuels responsible for 10 percent of the planet's warming so far, and 4 percent of the sea level rise. It was published last year by the Union of Concerned Scientists, the Climate Accountability Institute and scientists at Oxford University. 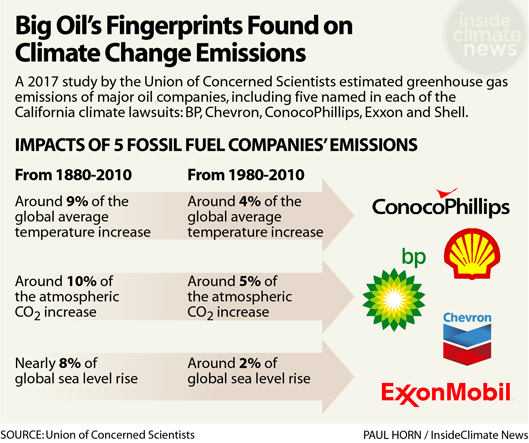 Carbon dioxide and methane emissions traced to five of the biggest companies — Chevron, Exxon, ConocoPhillips, Shell and BP — were responsible for about 9 percent of the rise in atmospheric CO2 from 1880 to 2010, the study found. Those companies are targeted in the Imperial Beach lawsuit and the other lawsuits filed in California. Global warming gases traced to the same five companies from 1980 to 2010, a critical span in which comprehensive scientific evidence emerged that burning fossil fuels was contributing to global warming, account for nearly 5 percent of the rise in atmospheric CO2 from 1880 to 2010. Ann Carlson, an environmental law professor at the University of California, Los Angeles, School of Law, said the science can help define what the companies knew, when they knew it and how they reacted. "The science has become so much more exact in identifying those responsible for creating the greenhouse emissions that it will make it difficult for the oil companies to deny responsibility," Carlson said. Dedina, whose family moved to the city when he was 7, embraces the role of the underdog mayor, taking on the titans of the industrial era. It's a familiar role. He was a boy in elementary school when he wrote a letter to the city's weekly newspaper, The Reminder, summoning all of the indignation of a fourth grader over a proposal to develop the Tijuana Estuary. "You said you were excited about a shopping center being built there and all that stuff. Did you ever think of all the wildlife that will be killed and the land that will be wasted?" Dedina wanted to know. In his mid-teens, Dedina and a couple of buddies planted themselves in front of a bulldozer to prevent the damming of the Tijuana River, again in defense of the estuary. Dedina saw the consequences of that action as nothing more than a raw publicity stunt could have ruined the estuary. A yellowed newspaper photograph shows Dedina being dragged from in front of the bulldozer. Dedina went on to study at the University of California at San Diego on a partial surf scholarship and later earned a Ph.D. in geography from the University of Texas. He channeled youthful indignation into co-founding Wildcoast in 2000. The international organization works on conservation of coastal and marine ecosystems. It's as though all the political and ideological fights have led Dedina to this challenge of the formidable fossil fuel industry. Even winning the mayor's chair was a struggle: In 2014 Dedina, the decided underdog in the race, ousted the incumbent by a margin of fewer than 50 votes.